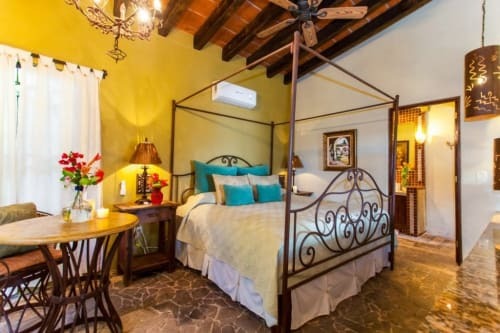 At Villa Poema de Amor, there are plenty of great accomodations from which to to choose. Our one bedroom casa options are perfect for a weekend getaway or secluded Sayulita stay. All of our 1 bedroom options can accomodate and sleep from 1-3 guests. Please note rates displayed are for Casa Lorca. 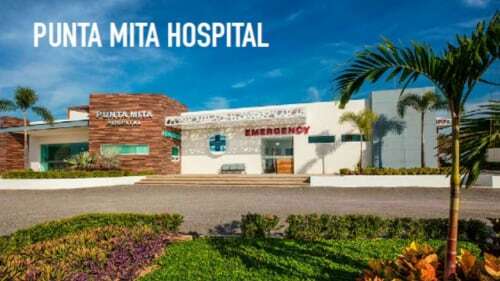 1 bedroom Casa rates vary. Please select the Pricing tab above for complete rates and pricing details. If you require 2 bedrooms, please visit our 2 bedroom villas page. If you need more space for a larger group, the entire house can be rented and accommodates 10-12 guests in 5 bedrooms, please visit our main Villa Poema de Amor page. Casa Lorca 1 Bedroom - Casa Lorca is a one bedroom unit located on the first floor. The open, airy space of Casa Lorca gives you a sense of tranquility and peace. Casa Lorca is a studio style layout, with a comfortable king size bed directly across from the kitchen and dining area. There is also a separate bathroom. Step outside from the main living space to a large patio with a palapa roof. There is plenty of seating and tables to enjoy a nice Sayulita sunset or sip on your morning coffee while looking out over the ocean. Casa Lorca is located on the same level as the infinity pool. Casa Hafiz 1 Bedroom - Casa Hafiz is a one bedroom unit located on the first floor of the villa. Casa Hafiz has a King size bed with a separate bathroom. The bedroom at Casa Hafiz overlooks the ocean and has a beautiful, private terrace. Casa Hafiz has a kitchenette that is supplied with all you need to cook simple, delicious meals. This casita can sleep two guests comfortably. Casa Hafiz is located on the same level as the infinity pool. Casa Rumi 1 Bedroom - Casa Rumi is a one bedroom suite located on the third floor of the villa. Casa Rumi has a King size bed with a bathroom including a romantic bathtub overlooking the ocean! This is definitely the most romantic honeymoon suite in the bay. The architecture is one of a kind with a stunning cupula ceilings over every room. The entrance leads to a private patio with a palapa roof. Enjoy stunning views of the Sayulita ocean while enjoying a cold cerveza or margarita! Casa Rumi has a well appointed kitchenette which includes a stove top burner, blender, coffee maker, and mini fridge. You'll aboslutely love your time spent at Casa Rumi. ***Golf carts are a great way to navigate the town and ensure easy access to town and nearby beaches. We can help you with securing a rental cart for your stay through our local rental companies. Villa Poema has a cart charge outlet inside the gates. Please use the contact form to get in touch with any questions and to request a reservation. Enjoy the peace and tranquility you will find at any one of our beautiful casas at Villa Poema de Amor! This place was amazing had a great view very clean everything was how it said it would be we definitely recommend!! Loved Los Muertos Beach nearby. Walked to town every day. We had a great time. It’s simple, it’s much more than you can ever imagine. We loved the Rumi suite! Amazing place with a great location. I would definitely recommend it. Had a great time! The entire Villa Poema de Amor is an amazing property. We stayed in Rumi, views spectacular, very clean, Antonio was there for our arrival and departure. Cleaners were very friendly and did an amazing job. If you don't mind a 10 minute walk to town its the place to stay in Sayulita!! Nice and quiet as it is slightly away from the town but not too far away!! Will defiantly return! We loved our stay in Hafiz! Fantastic location. Walk to beach/town. Yet secluded and private. Perfect. Seasonal rates are per night and in US Dollars. Please note that $250.00 security deposit is collected and held until 7 days after your stay. You are personally responsible for any damage incurred over that amount. If you require 2 bedrooms, please visit our2 bedroom villas page. If you need more space for a larger group, the entire house can be rented and accommodates 10-12 guests in 5 bedrooms, please visit our main Villa Poema de Amor page. When I am not overlooking the beautiful bay of Sayulita, I live in a small, culturally rich town, Ashland, in Southern Oregon. Home of the Oregon Shakespearean Festival, Ashland offers great theater, a vibrant arts community and lots of good restaurants! I am a realtor and also teach Psychology at Southern Oregon University. I have a passion for poetry and for being on water which are the two inspirations for my designing and building Villa Poema de Amor, Villa Love Poem.Why SayulitaI first came to Sayulita in 2003 and fell in love with what was, at the time, a sleepy little fishing and surfing village! While Sayulita has become far more popular and discovered since then, it has always kept me in awe of its natural beauty. I still enjoy running on the beach, which is just long enough for a good workout and I enjoy all the wonderful options for yoga in town. 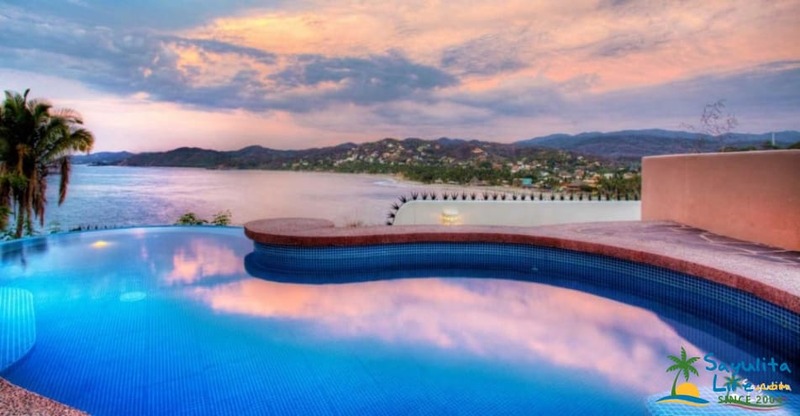 For a small town Sayulita also has a lot going on, many activities to enjoy and nearby places to explore.What Makes this Villa Unique?Designed by architect, Miquel Valverdez and built by Arturo Fernandez, Villa Poema de Amor is like no other villa in Sayulita. 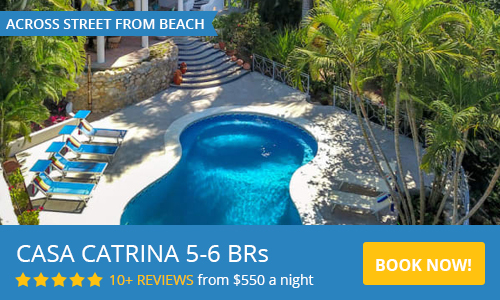 Perched on the south tip of the bay it literally has 360 degree views of the jungle, Los Muertos Beach, Sayulita Bay and town and all the way to San Poncho. The views are stunning. The architecture too, is unique. Inspired by my travels to Greece, the blue cupolas can be seen from most anywhere in Sayulita, right above Villa Amor. All the rooms are furnished with custom built and carved furniture and many pieces are curved like the soft rounded walls. Every detail has been thoughtfully designed and artfully made by local artisans, including hand painted sinks, hand carved furniture and mirrors, playful accents in the ceramic floors, unique and custom wrought iron railings and accents and carefully chosen art. The rounded brick cupolas in every room of the top floor, Casa Rumi, are architecturally stunning. This romantic villa was lovingly crafted with attention paid to every detail.In designing Villa Poema I wanted to reflect the romance of this exquisite location overlooking the sea, naming it Villa Poema de Amor after my two passions…love and poetry. I named each of the individual casas after poets: First floor, Casa Hafiz (Persian poet Hafiz) & Casa Lorca (Spanish poet Fredrico Garcia Lorca); second floor, Casa Neruda (Chilean poet, Pablo Neruda); and third floor, Casa Rumi (world’s most revered love poet, Persian poet, Rumi).I look forward to sharing this very special place with you and hope you will enjoy your memories long after.